Hi - I want to tell you about a site called Artisoo.com. This is website is a leading one-stop online store committed to becoming the best reliable marketplace on the net by offering superior customer services, worldwide shipping and variety paintings (Chinese paintings & oil paintings). They also provide a wealth of information about arts, artists and their imaginative creations. Artisoo believes that a passion to collect and own art is born out of appreciation of art, knowledge, and understanding, and is going to make our planet a better place to live. Artisoo is asking anyone who wants to enter this giveaway to simply leave a comment on this post stating which of the 6 paintings listed above you like best. Ends 2 weeks from now. I think I personally will choose either the Fishing Boats or the Wheat field. Those are my two favorites! EDIT: adding a few more bonus options - but you must do mandatory entry of commenting what painting you like best first. Leave separate comments for each entry. do any or all. And the winner is Sweepstake Lover from Turkey. If you and your readers really like our paintings we would like to offer a $30 coupon(coupon code: 30GIVEAWAY) as an apology gift. 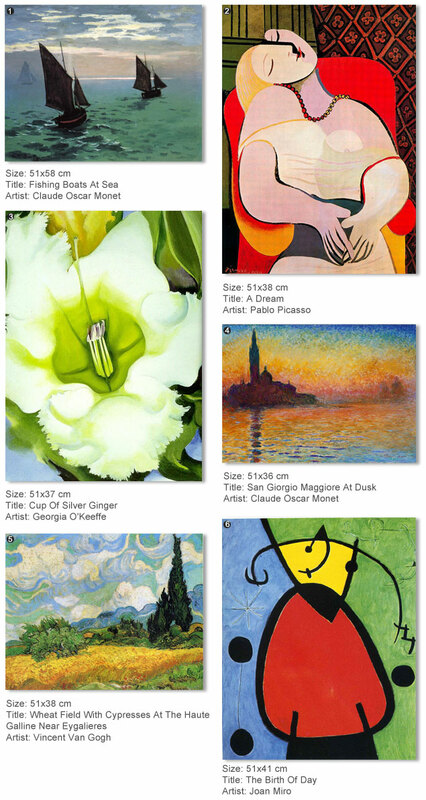 The $30 coupon can be used in purchasing any paintings on Artisoo.com while It cannot be combined with any other offers and discounts offered by artisoo.com. It will be expired in 1 month, please just entre the coupon code during checkout. Disclosure: this is a sponsored review/giveaway through 4sponsor.com. Artisoo is responsible for prize fulfillment and I will be receiving a painting as well. All opinions remain my own. I like Cup of Silver Ginger. I like the colors and its pretty. I would love the San Giorgio Maggiore at Dus. I love the Georgia O'keefe painting. I love her stuff! I would like the Wheatfield with Cypresses painting. I looove "Wheat Field with Cypresses!" I LOVE San Giorgio Maggiore at Dusk! It's hard to choose! I love classic art! I like Fishing Boats At Sea and San Giorgio Maggiore at Dus, but I would probably choose Wheat Field with Cypresses because I'm a big fan of Van Gogh. I follow you on Pinterest, username egholtrop. The San Giorgio Maggiore at Dusk is beautiful! Hard to say, but I'd pick San Georgio Maggiore at zdusk. I like Fishing Boats at Sea! I would love The Birth of Day - Miro is wonderful! Thanks! And added you on Google+! carbear783. I like most of them for different spaces "A Dream" By Picasso would be great for our bedroom or office the colors are perfect for it. I follow on Twitter as @bookloon. I followed on Twitter. I like the Wheat field with Cypresses. I like the Fishing Boats at Sea the best. I like you on Facebook (Les Johnson). I follow you on Google + (Les Johnson). I like the San Giorgio Maggiore at Dusk. The colors in it are great. I follow you on twitter as rickyroberts123. I like your page on Facebook. My Facebook name is ricky roberts. I am now following you on pinterest as rickyroberts399. We are google+ friends now. Same name as I am commenting with. I love the Fishing Boats and Sea. My favorite is the 4. San Giorgio Maggiore at Dusk print. like your FB page (my name is joan smirth). follow on pinterest as joansmirth. I like #1 and #4. If I have to choose between them, I think #4 might be a little higher on my list. I added you on Google+ with the same name as my comment. I am following you on instagram. Following as deannalw47. I am now following on pinterest. My pinterest name is dlw47. I liked you on Facebook. My Facebook name is deanna lynn. I am following you on twitter. My twitter handle is dlw447. I would choose Cup Of Silver Ginger as Georgia O'Keeffe is one of my favorite artists and I studied her in college. Beautiful painting!!! I follow Suec on twitter as birdiebee52. I Like STAY AT HOME MOM on FB as terry stevens. I follow on Pinterest as birdiebee52. I follow on instagram as birdiebee52. I love Fishing Boats at Sea. I would love to win Georgia O'Keefe's Cup of Silver Ginger. I love "Wheat Field with Cypresses" and "San Giorgio Maggiore At Dusk." Both are so pretty! kristiedonelson(sat)gmail(dot)com Thank you. Like you on Twitter. @kdonelson kristiedonelson(sat)gmail(dot)com Thank you. Like you on Facebook. Kristie Morrison Donelson. kristiedonelson(sat)gmail(dot)com Thank you. Follow on Pinterest. Kristie Donelson. kristiedonelson(sat)gmail(dot)com Thank you. Follow with Google+. Kristie Donelson. kristiedonelson(sat)gmail(dot)com Thank you. Sorry about my email kristiedonelson(at)gmail(dot)com Thank you! Wheat Field With Cypresses At The Haute Galline Near Eygalieres - for my sister. My favorite is the Cup of Silver Ginger, so beautiful! Following you via Facebook as Kim Reid. Following you via Pinterest as yarnaddicted3. Hot Moody Mess Update & $50 Coupon Code!